We believe that all people deserve art and culture in their lives -- from a moment of personal inspiration, to a neighborhood musical gathering, to a glorious production that brings thousands to their feet, to a movement that joins diverse people and cultures together, to the greatest of all: uniting nations through creative expression, not politics or conflict. Arts and culture can be a vehicle to spark conversations, to spur social change and make our communities strong, healthy, and above all equitable. Together with you, we hope to build a community that prioritizes access to arts and culture resources for all of its people. Tackling the issue of equity and inclusion requires commitment, respect, patience, determination, and flexibility. We discovered early on in our own work that there is no one right way to achieve equitable results and that we will make and attempt to correct mistakes along the way. With this realization in mind, we ask you to commit and continuously recommit to being part of a bigger conversation about equity and inclusion that aims at breaking down barriers and building bridges across communities. * Provide tools to promote equity and inclusion by reducing barriers to participation and increasing engagement. * Create a common language among organizations and help organizations track progress. * Remind ourselves that the bigger picture can be broken down into small, manageable pieces. * Highlight, acknowledge, celebrate, and learn from the efforts and progress arts and culture organizations are already making. 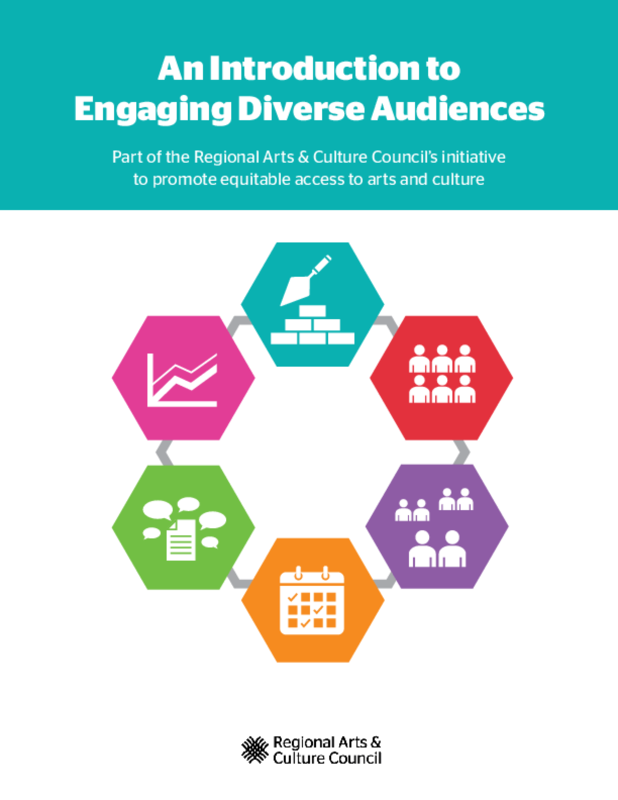 Copyright 2014 Regional Arts & Culture Council.